World-famous sculptor Marshall Fredericks may not have realized just how important his “Spirit of Detroit” statue would become when he was commissioned by the Detroit-Wayne Joint Building Authority to create a statue to be placed in front of the brand-new City-County Building (renamed the Coleman A. Young Municipal Center in 1997) August 2, 1955. The Spirit of Detroit statue was cast in Oslo, Norway. Acid was placed onto the bronze statue, oxidizing it, giving it its green color. It took a few weeks to create the right color, something nature could only do in a couple hundred years. Its next stop was Detroit, Michigan! The Spirit of Detroit arrived on the docks of the Detroit River, September 20, 1958 on the Thomas Schulte ship. It was unloaded and taken to the City-County Building for an official ceremony days later. At that time, there was no Renaissance Center, Detroit Center One, or One Woodward Avenue across the street. Three days later, September 23, the Spirit of Detroit was officially dedicated to the city. Dignitaries from Norway, Wayne County, Detroit Mayor Louis Miriani, and Marshall Fredericks and his family attended the event, along with hundreds of curious Detroiters marveling at the new edition to downtown. A cool tradition has been placing sports jerseys on the Spirit of Detroit. The Detroit Red Wings, Tigers, Lions, and Pistons have all appeared on the statue. Even a Michigan State football jersey was placed on it. It has a value of over $1 million as of 2013. 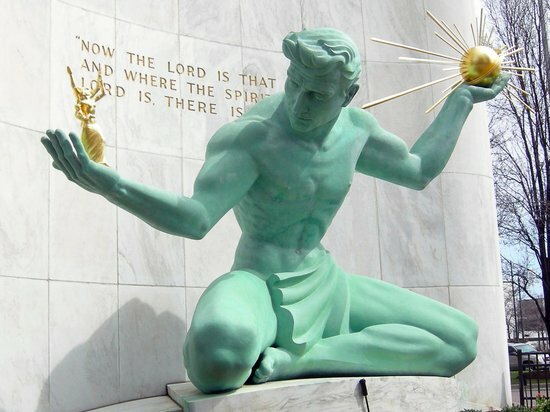 The City of Detroit and Detroit FC soccer clubs use the statue as their logos. The city threw a party for the famous statue back in May. On Friday, there was another celebration inside the City-County Building where city, county, and state dignitaries spoke, including Senator Debbie Stabenow.